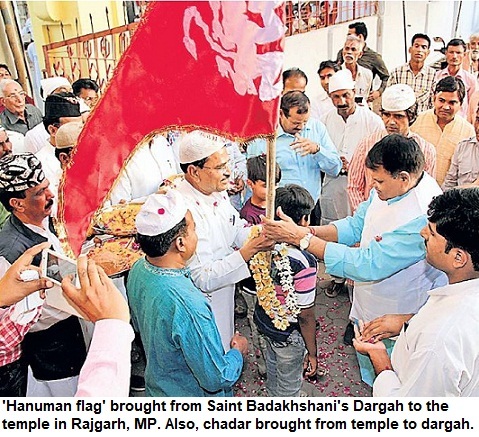 Thousands of Hindu Jagran Manch [HJM] activists battled with police and tried to stop Namazis from entering the Kamal Maula Mosque in Dhar in Western MP. Seeing the images on television, one could not help but wonder about the era of Rani Roopmati. In those days, there was much more tolerance. Roopmati was a devout Hindu woman. She had taken a vow of not having her breakfast until she had a 'darshan' of Narmada river considered sacred among the Hindu populace like Ganga and Yamuna in UP. 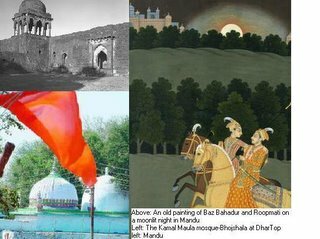 King Baz Bahadur, who ruled Malwa in those days, built the Roopmati palace on the hill to facilitate the 'darshan'. The river is so far that it is almost impossible to see it but the architects took great pains and raised a gem of palace here. Sitting atop the pavilion on this palace, early in the morning one gets a glimpse of the silvery hair like Narmada when the first of the rays of sun fall in the morning. The reflection of the sun on the faraway Narmada gives the impression of a silvery hair far in the Vindhya ranges. That was for Roopmati. On my visit to Mandu as a young boy almost a decade ago I was captivated at the sight. Baaz Bahadur hardly cared about his throne. The Mughals finished this sultanate and he fled to Rajputana [now Rajasthan]. Roopmati is said to have killed self. And yes the tomb of Hoshang Shah. It is a mystery no one could solve. Throught out the year a drop of water falls on the mazaar every day in the afternoon. It is understood that during rains the water gets stored somewhere in the top of the tomb. Through some marvellous architecture [and science] this water does not either evaporate or go dry and keeps falling drop by drop through out the year until the summer. Meanwhile, as far as what happened in Dhar today. Nearly 13 Muslims were taken under heavy security inside the mosque and prayers were held amid stone pelting. Earlier the police lobbed tear gas shells, forced the Hindu activists out, resorted to cane charge and somehow the day passed until the next Juma will coincide with puja. Then, there may be tension once again.